After coming up with the idea for Wanderlust, Jeff Krasno decided how he wanted to go about starting it. "We're going to shoot for the moon and see where we land," he said. The owner of Velour Music Group, which has helped put together festivals like Bonnaroo and Austin City Limits Music Festival, is teaming with his wife, Schuyler Grant, who organizes yoga retreats all over the world, to start Wanderlust. Krasno wants to have a few Wanderlust events each year. He visited sites in Colorado, Vermont and Montreal before coming to Squaw Valley. "It was so immediately captivating," he said. "It inspired me in a way that no other site inspired me. First just the natural beauty is just ridiculous." Then came the clincher. He was shown a photograph of the last event at the Gold Coast area above the village. It was a 1991 concert by the Jerry Garcia Band. "I thought, - What if we actually did this at the top of the mountain?" he said. Michael Franti was the first artist he thought of inviting. Franti, of course, is a well-known musician and yoga enthusiast. 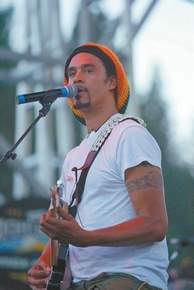 Franti, who was happy to perform, started the Power to the Peaceful festival in 1999. "The key to it is to really have the approach to it as giving," Franti said. "That way you you're going to exceed the expectations of the people who come. That way no matter what happens, if it's a huge turnout the first year or not, people go away thinking, ... we're going to tell all of our friends about this. I think that's really the key. This event should really have that kind of vibe. This has some amazing music and the best yoga teachers in the whole country. It should be great experience for people." The yoga community has grown and evolved in the last decade. "A lot of people associate the yoga world as a old hippie in a field with a crystal," Krasno said. "It's really not that anymore. It's become a really central part of a lot of young people's live, young professionals, both male and female." Wanderlust should attract a like-minded crowd. "The cultivation of one's health also extends beyond one's own body," Krasno said. "It really extends to things like the environment and issues like sustainability. Local food and organic food. The community and their value system was very central to what we got inspired to build. ... I thought this was the kind of community that would embrace a real forward-looking and progressive event."